Sydney is a rare gem in a holidaymaker’s list of potential destinations; a city break minus the stress and chaos of a city, with stunning and iconic beaches thrown into the bargain. Glamorous, sunny, chic and the epicentre of laid back Australian cool – a stay in Sydney can include city sights, the boutique shopping and fine dining experience that comes with a globally renowned and cosmopolitan city, beach time and nightlife all blurring into one hazy, summer-filled experience. It is lauded as one of the jewels in Australia’s crown and it doesn’t disappoint. As a site of Australian National Heritage and arguably one of the world’s most famous beaches, Bondi beach is located in the eastern suburb of Sydney of the same name. First impressions are of bright, hot colours; tantalisingly white sand, electric blue sea and flashes of red as the famous Bondi surf life savers patrol up and down the beach. The sand stretches for about 1km in front of a relatively low rise commercial area of cafes, shops and hotels. Compared to other city beaches commonly fringed by towering hotel blocks which overshadow the natural beauty, Bondi remains the centre of attention and the atmosphere is pleasantly low-key and relaxed. Set up your towel, or hire a deck chair, and soak up the sights of a classic Australian beach scene. Get a glimpse of the serious surfers, bobbing around before catching one of the crashing white breakers and speeding in towards the sand. Go for a dip in the crystal blue and white water in between the red and yellow flags of the patrolled safe-swimming area at the North end of the beach. Bored of lounging, there are lots of souvenirs shops on the beach front where you can buy colourful Bondi souvenirs or for slightly better shopping head further back into the town to Hall Street. 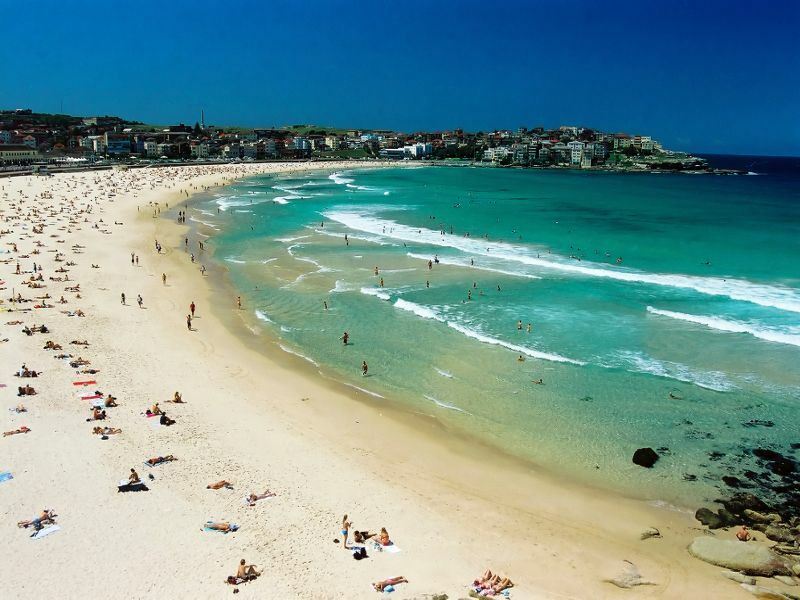 Bondi Beach is best accessed by bus, which runs several times an hour from Circular Quay in the centre of Sydney. The journey takes around 45 minutes but is easy to find, and a relaxing way to travel through the city. If you are staying for a few days it is well worth buying some kind of travelcard; one that incorporates train, city and ferry allows you the most freedom and makes travelling around the city varied and stress-free. The centre of Sydney offers plenty of diversions if you fancy a break from the beach. In particular, The Rocks area of boutique shops, markets, gorgeous buildings and narrow café-lined streets can distract you for hours, stop for lunch in one of its many delicious independent eateries and absorb the relaxed pace of life around you. Cross the harbour and take the obligatory photos of Sydney’s most impressive and well-known landmark in the sail-like shapes of the opera house. Enquire inside if there are any last minute tickets for the evening show, these are often discounted and it is a once in a lifetime experience. Save money on the expensive harbour cruises that are advertised everywhere and travel to the suburb of Manly by the pedestrian ferry, which gives you all the award-winning views of the harbour for a fraction of the price. Manly is a gorgeous suburban area of Sydney with a much quieter town centre, and beautifully clean and calm beach area. It is family friendly with a sheltered pavilion area, and a selection of quaint arcades and beach side cafés. Catch the ferry back at twilight and enjoy the lights of the opera house reflecting off the bridge and water of the harbour in a breath-taking night time vista of the city. Sydney of course offers accommodation to suit any budget, but as a suggestion for someone wanting to absorb the atmosphere of this friendly and lively city it has got to be Wake Up Hostel on the corner of Pitt Street and George Street, and a stone’s throw from Central Station. This huge multi-floor hostel offers a range of dormitories and private double rooms, with a self-catering area as well as a café and a bar in the basement, and welcomes an array of guests, travellers and holiday makers. The atmosphere of this iconic city and surrounding beach area is like something out of a film; everyone seems to be smiling, the water of the harbour glitters as a reflection of the glittering skyscrapers of the city. It is beach, glamour, city, sunshine and surf all rolled into one and is a true Australian holiday experience.